If you are going to get a CSA box and you happen to live in western Washington, be prepared for a lot of greens. Especially when it is a particularly wet and cold spring. I realize everyone else in the country is hot but we just had about our fifth day where the weather got above 80 this year so yeah, we're feeling a little grumpy about it. Actually, I think people in Seattle have very short attention spans, so if it is a gray week we think it has been a horrible summer and if we have a couple of sunny days in a row, we forget what rain looks like and become unable to drive it in when it comes back. Actually Seattle drivers can't drive if it is raining too hard or too sunny or pretty much any other day, but I digress. You get a lot of greens: kale, lettuce, beet leaves, spinach. So sometimes I have to be a little creative and I have started making one dish dinner salads to use up as many of my vegetables as possible. I used up some carrots and radishes (which I don't particularly care for). They added a nice crunch to the salad and soaking them in rice vinegar gave a great bite to the dish. I even ate all the radishes. 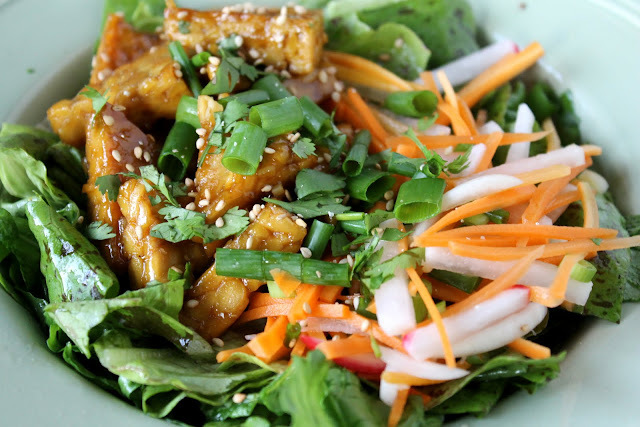 Salads are not necessarily very filling, so I like to add some protein (tofu or tempeh or chicken). 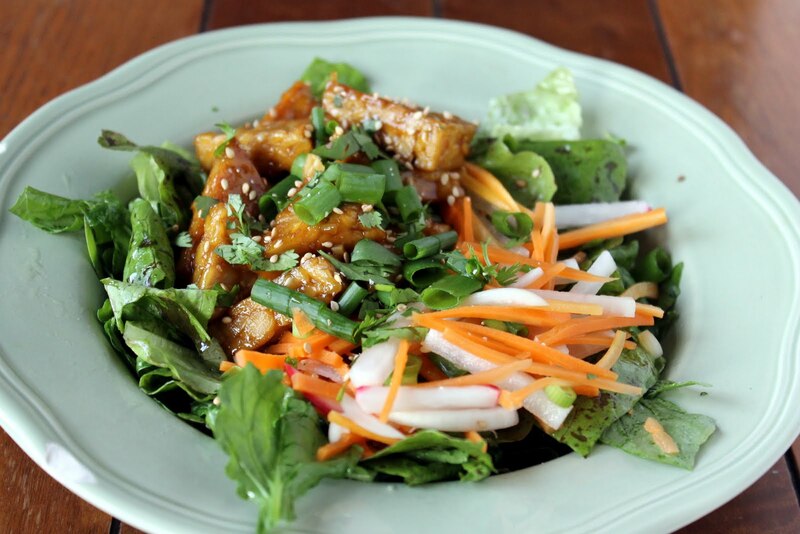 This salad has one of my favorite 101 Cookbook recipes for orange pan-glazed tempeh. I made a quick sesame oil/rice vinegar This one started out withdressing which was pretty tasty. Salad dressings are so easy. The basic ratio is 3 parts oil to 1 part acid (vinegar or lemon juice etc.) then you can add salt and pepper and other seasonings (tarragon, shallots, chives, dijon etc.). I have an old mustard jar that I use to make my dressings; I just put in all the ingredients, screw the lid on and shake. This emulsifies the oil and vinegar and takes about two and a half seconds. Way better than store bought. 1. 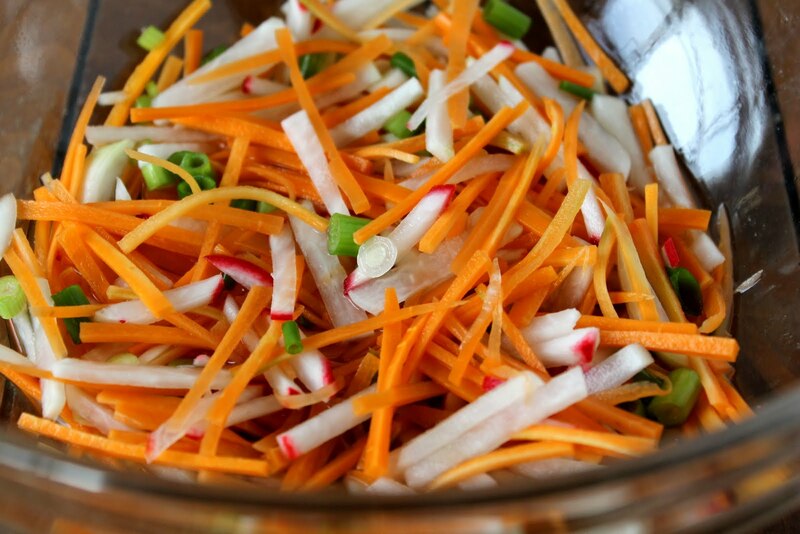 Julienne the carrots and radishes. Toss with 1/2 cup rice vinegar and let sit. 2. For the tempeh: Put the orange juice in a small bowl. Squeeze the grated ginger over the bowl to extract the juices, then discard the pulp. Add the tamari, mirin, and maple syrup, ground coriander, and garlic. Mix together and set aside. 3. 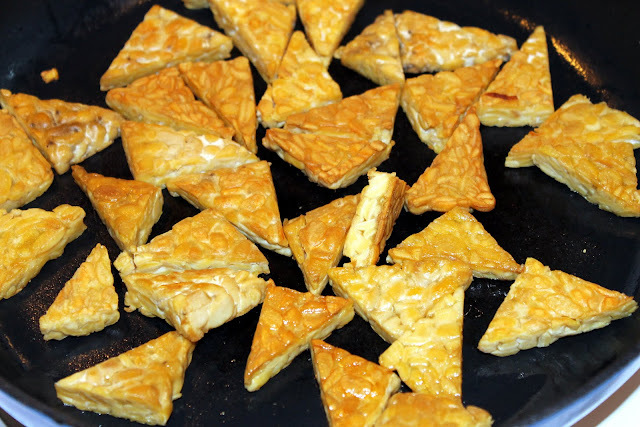 Cut the tempeh into thin-ish, bite-sized pieces. 4. Put the olive oil in a large frying pan over medium-high heat. When the oil is hot but not smoking, add the tempeh and fry for 5 minutes, or until golden underneath. Turn and cook the other side for another 5 minutes, or until golden. 5. Pour the orange juice mixture into the pan and simmer for 10 minutes, or until the sauce has reduced to a lovely thick glaze. Turn the tempeh once more during this time and spoon the sauce over the tofu from time to time. 6. For the dressing: mix the oils, whisk while slowly adding the vinegar. Season to taste with salt. 7. To assemble: toss salad with dressing. Top with the tempeh and carrots. Sprinkle with toasted sesame seeds. this looks delicious. do you have a mandolin? not sure I could get things that tiny without one, but they scare me.